Most of us have probably seen this screen on a computer monitor – at least those of us who are not Mac users. It’s always kind of an ominous looking thing, and you have that nagging thought in the back of your mind that if you choose the wrong option your whole computer will crash and burn. The Safe Mode option sounds good, right? So you pick that one. 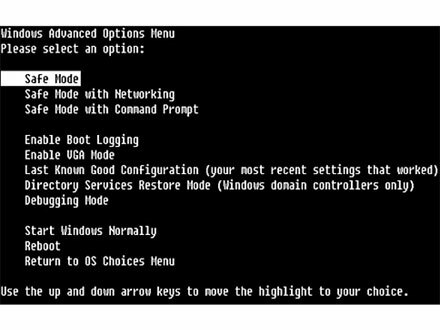 Your computer has limited capability while in safe mode, but for the most part, you will find success in recovering whatever it is you need to recover. Either that, or you get the blue screen of death. We don’t like the blue screen of death. But that’s a topic for another post. I will confess to you that I rarely use Safe Mode. Even when I probably should. Why? I don’t really know, except maybe because it is an extra step that seems totally unnecessary. Okay, now computer techies everywhere are pounding their desks in frustration, yelling at me in their language of defrag and interfaces and 64-bit, a language which, oddly, I understand. So keep it down, guys. I am also not in the habit of living my life in safe mode all the time. I think I’ve mellowed over the years and I don’t take the same risks I used to, but I still like to get out there and try new things. It’s all an adventure. When you live in safe mode – like the computer – there is a lot you can’t do. Your options are limited. You can have a good life in safe mode, but you will definitely miss a lot. Sometimes getting yourself out there can be scary. The unknown is – well – the unknown, and you don’t know what to expect. But the surprises are worth it. Trust me! Try something new. Go somewhere you’ve never been before. Meet some new people.